Even though summer days get very hot in Nevada, evenings are pleasantly cool. These past few nights, my husband and I have been making the most of it by relaxing out on our patio. 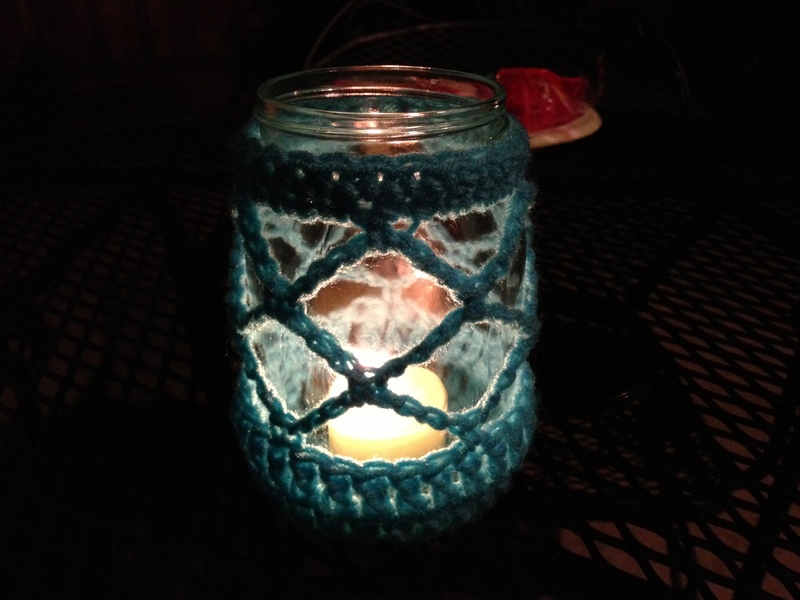 So when I came across little Z handmade’s pattern for summer candles, I knew I wanted something like that on my patio. Of course, I had to make some alterations to the original design. For starters, the original design calls for the addition of a wire handle so that the lantern/s can hang from a tree. Unfortunately, I have desert-scape in my backyard (as do most Nevadans) and so I don’t have any trees from which to hang lanterns. Not a problem, though, because my idea was for the jar to sit on my patio table. Secondly, because my jar wasn’t as wide (or maybe my stitches were too big), I ended up cutting out the last single crochet round – so I only did 30 stitches instead of 36. One thing to note, which wasn’t explicitly stated in the pattern and can be confusing for beginners, is that the single crochet stitches are made in a spiral – this is unlike completing rows in the round. Because you won’t have that visual cue to let you know where one “row” started, you’ll want to make sure to use a stitch marker. The stitch marker will go into the first stitch of your “row;” when you get to the end of that row, you’ll remove the stitch marker and place it into the first stitch of your next round. Because I cut six stitches from the base circle, this resulted in one less loop when it came time for those. Speaking of which, the pattern calls for chain-10 loop; I did chain-8 because ten chains made the diamonds too open. If I had left the loops at chain-10, I would have had to use one less row and the diamond effect would have been lost. With chain-8, I was able to do the three rows and still showcase the diamond design that really attracted me to this pattern. More than anything, I liked that this project was very quick to complete. I started and finished just in time to enjoy at tonight’s evening grilling. And here is my final project! I’m extremely pleased with the final result. It was exactly as I had envisioned. I really like the soft glow of the light against the design of the pattern. 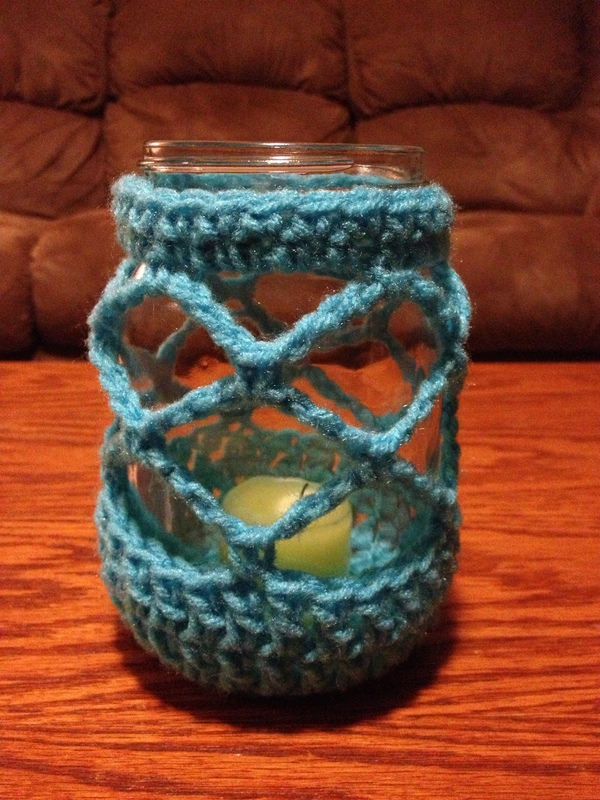 Amazing how a little bit of yarn can truly dress up a jar. Here’s to more pleasant summer evenings that will now also include a hint of crochet. Do you like? Be sure to leave me a comment to let me know what you think of the final product.